Security built into every app. Everywhere. Unified security monitoring and protection for modern cloud & on-prem environments. 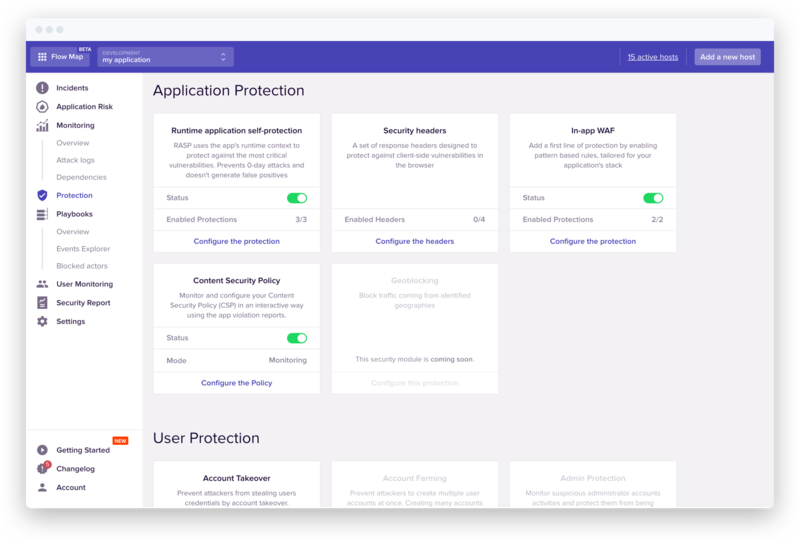 Easily enable protection modules (RASP, in-app WAF and more) that are tailored to your stack, get unprecedented visibility into your security and scale it in production. Out-of-the-box modules protect apps against a broad array of threats. Setup takes minutes, no config required. Access to more detailed security analytics than ever, including app-level incidents you can act on immediately. A platform where developers, ops and security teams can collaborate, scaling application security without losing velocity. After Application Performance Monitoring (APM), Error and Log monitoring it’s time to add a security component into your app. Sqreen’s microagent is a library that automatically monitors sensitive app’s routines. No performance impact, no false-positives: security as it should be. Our website and applications are under constant attack from hackers and bots. Sqreen allowed us to secure our apps with staggering efficiency and was incredibly fast to set up. Sqreen is the best solution we found to protect our apps at MoneyPark. We can now make sure that employees and users accounts are safe. Developers and businesses of all sizes use Sqreen to monitor and protect their apps without slowing development speed. Get started in minutes with no configuration or maintenance required. Sqreen automatically adapts to your application stack and alerts you when your attention is required. 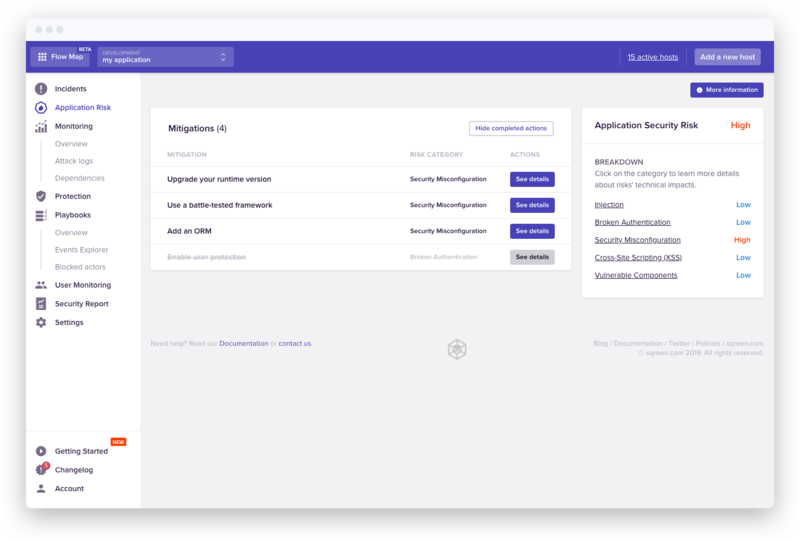 Manage your application security on a single platform. Add RASP, in-app WAF or account takeover modules at the application level without generating false positives or requiring development time. Understand your current risk level and easily prioritize your security efforts with actionable insights so your company can grow faster. Build better and more secure applications without hassle. Deploy Sqreen microagents on Cloud, Private Cloud or on-premise as a lightweight library into your app. Get started with Sqreen without code modification. Use our SDK to add additional monitoring layers.